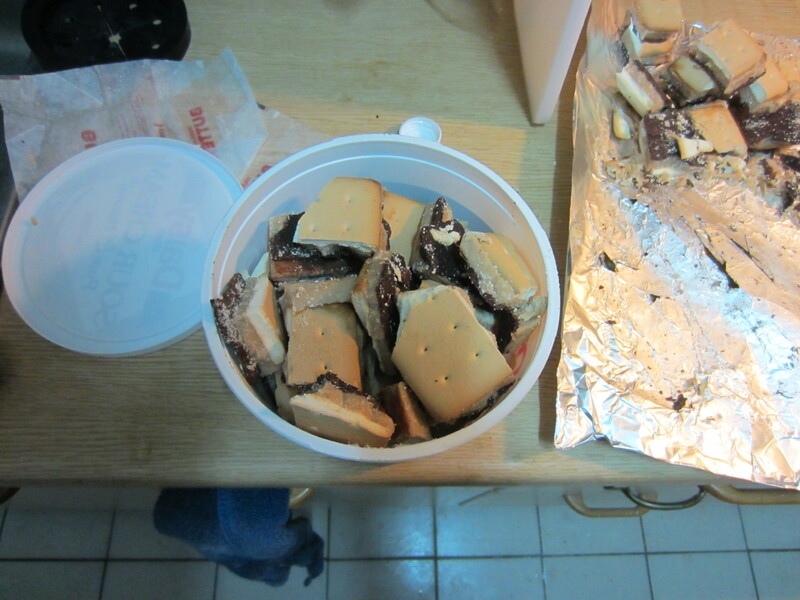 Growing up, my mother’s English toffee was one of my favorite candies. She only made it around Christmas, but now I’m grown up and see how easy it is to make, which means I make it more often. 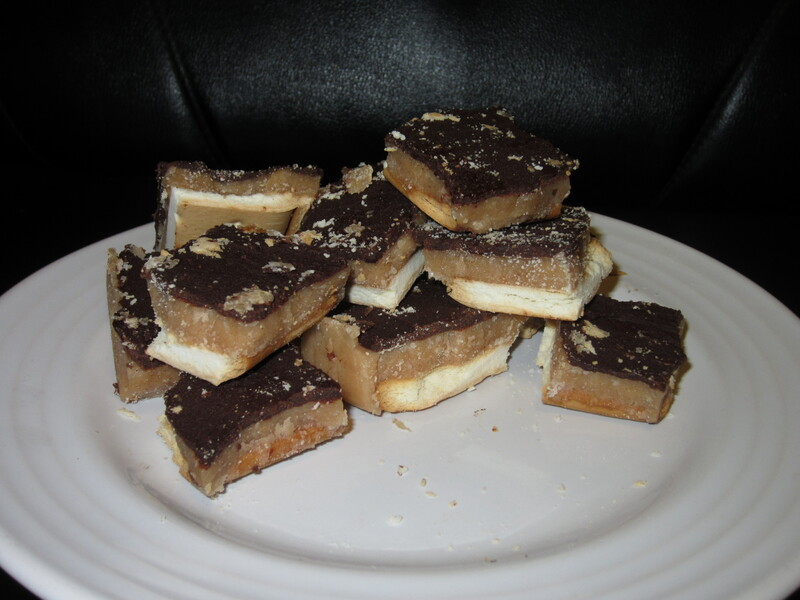 The ironically-named English toffee (being a toffee some say is not toffee) is incredibly simple and easy to make. Everyone has a different recipe, but they all boil down to two things: sugar and butter. 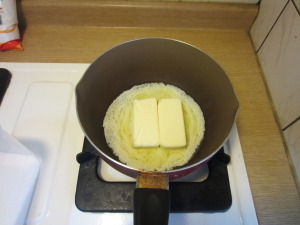 I use two sticks of butter and a cup-and-a-half of sugar, but you can find other recipes online that call for anywhere from one-and-a-quarter to two full cups of sugar. The key to candy is moisture content. 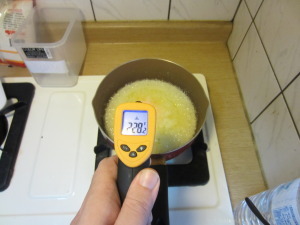 Candy has different stages, identified by temperature levels, that indicate how much moisture is left in the cooking candy: the hotter the candy, the less moisture, the harder the cooled candy. Sugar caramelizes at 320°F. 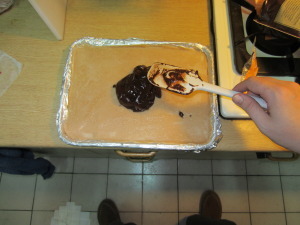 English toffee should be heated to no less than 300°F. 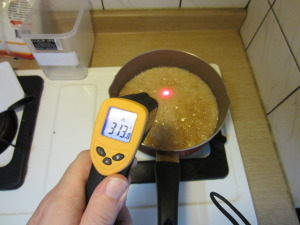 Anywhere between those two temperatures is where you want to cook the English toffee, depending how how you like it; 300° sugar will be softer, after it cools, than 320°F sugar will be. 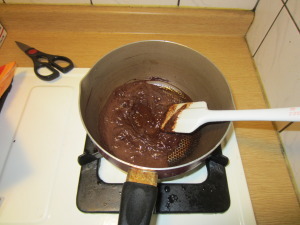 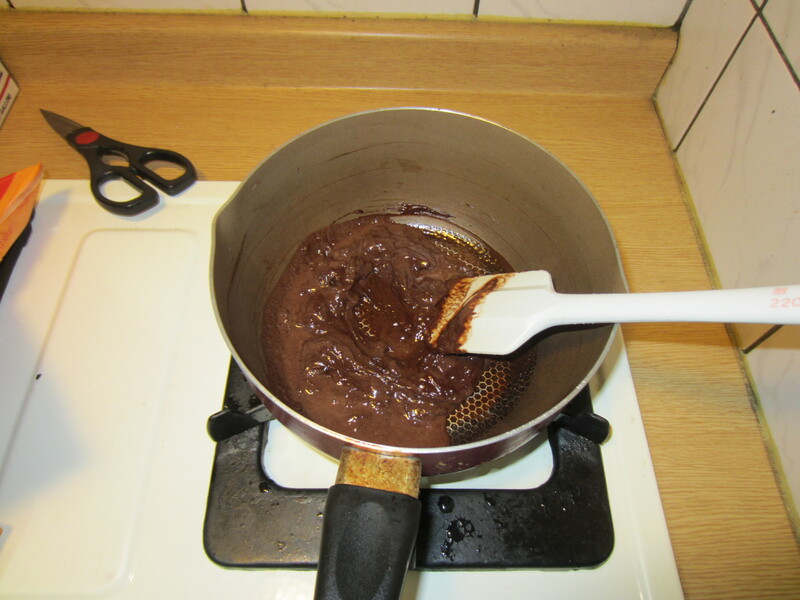 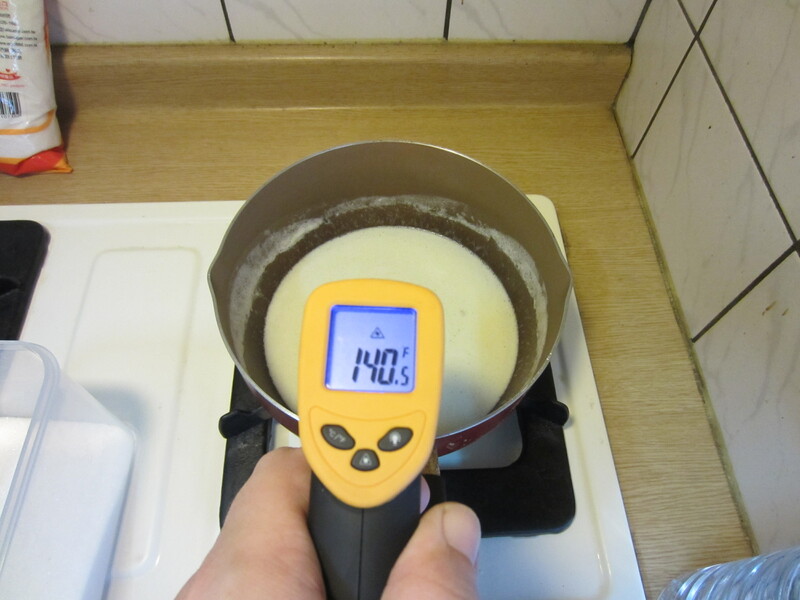 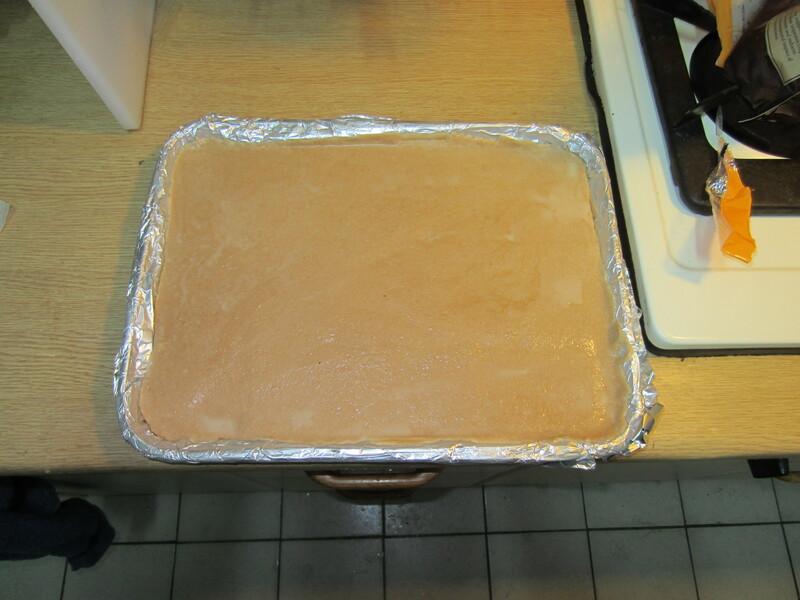 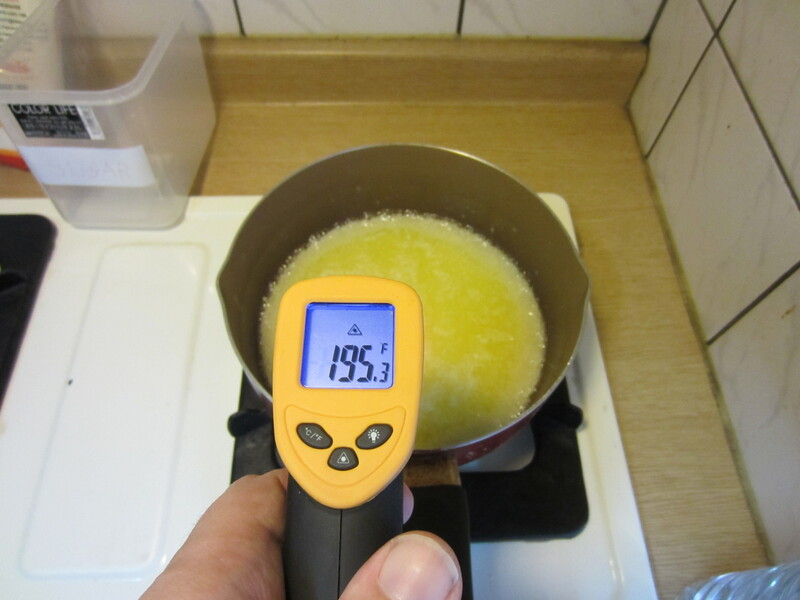 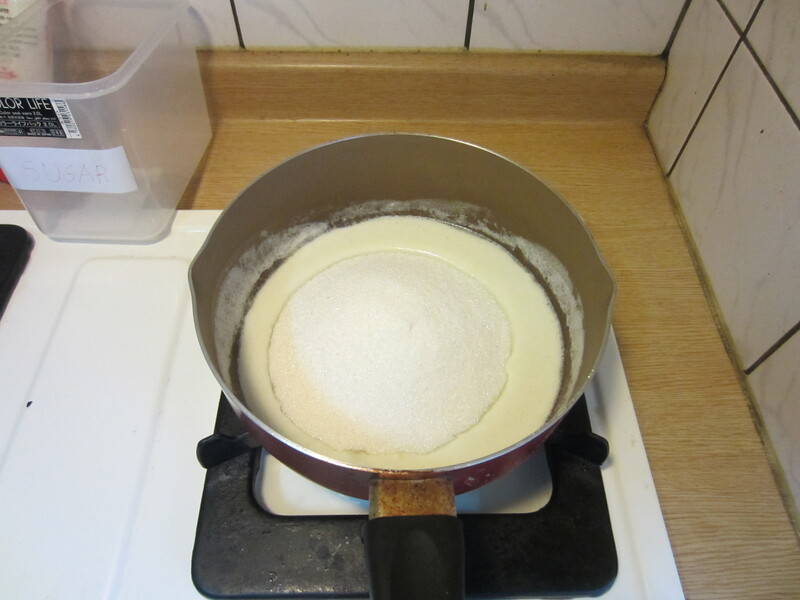 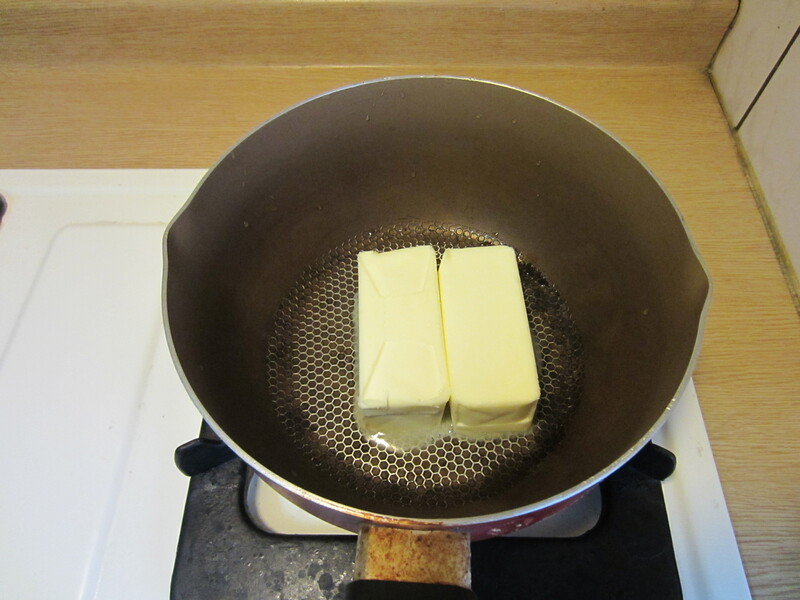 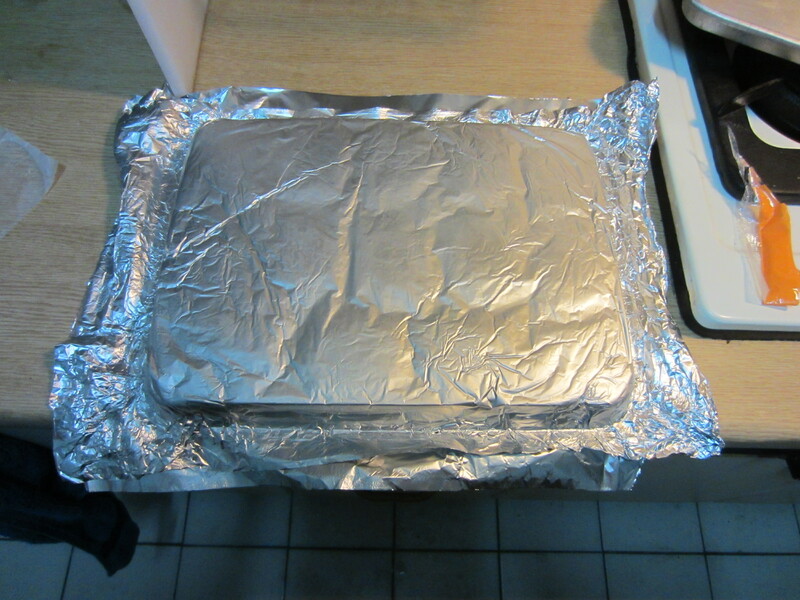 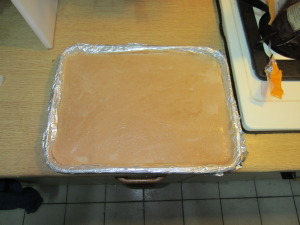 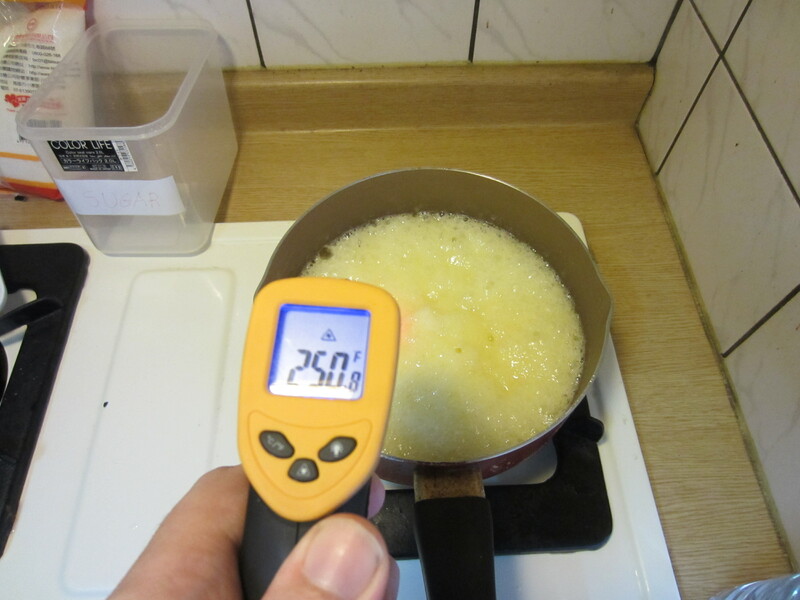 Heated slowly to 250°F, the sugar and butter will combine as the sugar liquefies and the moisture evaporates. 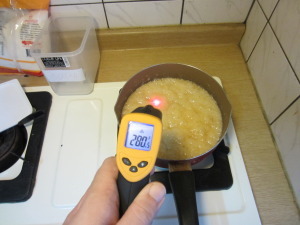 At 280°F, the color will turn from yellow to brown. 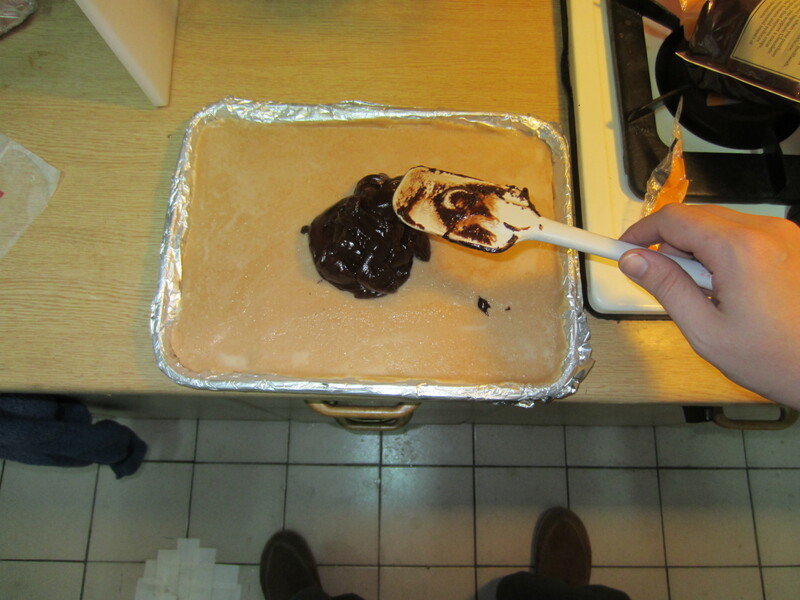 Most would remove the toffee before it gets past 310°F. 310°F is the hottest you want the English toffee to get; anything over 320°F risks burning the English toffee. 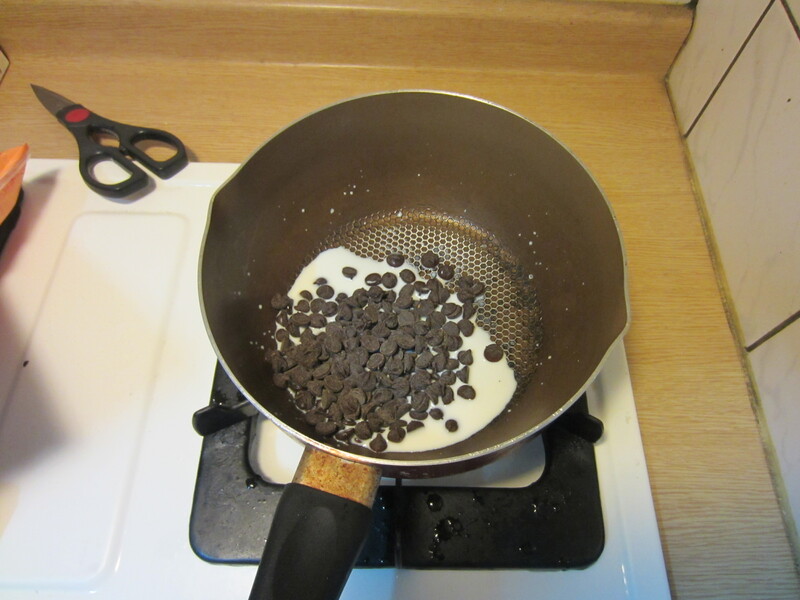 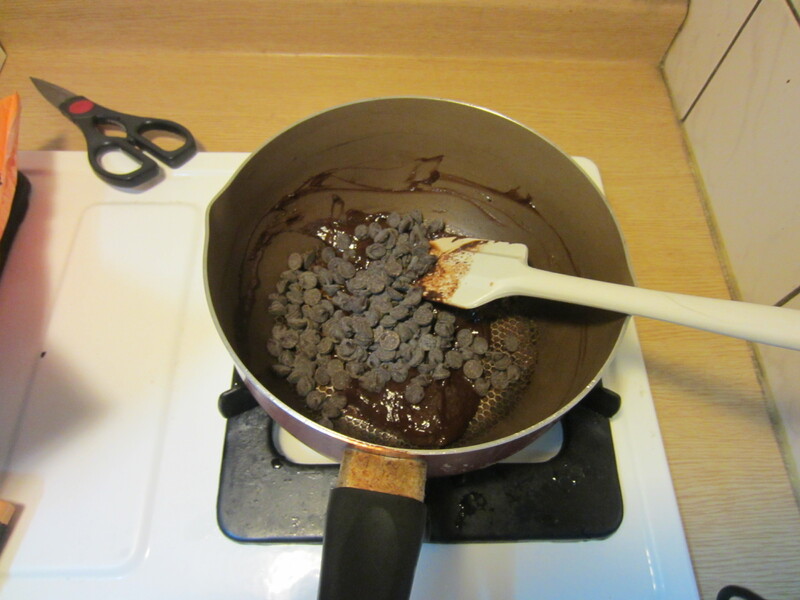 Then add another half-cup of chocolate chips. 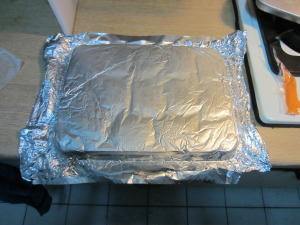 One of so many good reasons to use foil. 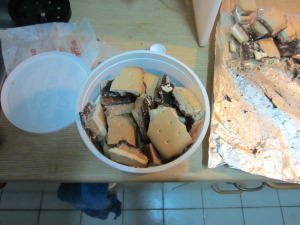 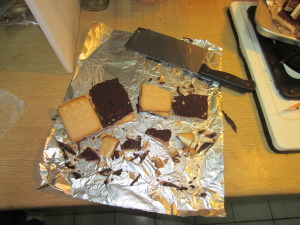 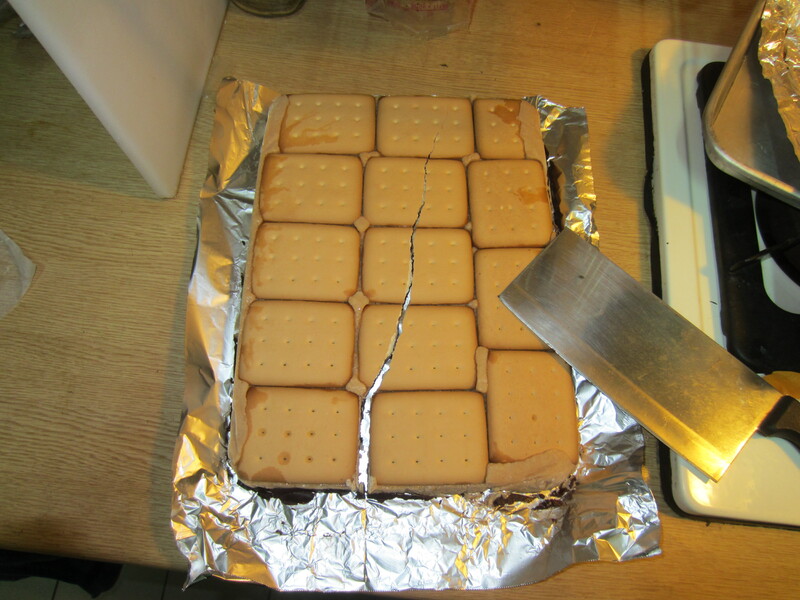 No matter how you cut them, they will often break with the English toffee, not the cookies. With the right precision and extra-sharp knife, you can prevent it, to an extent. 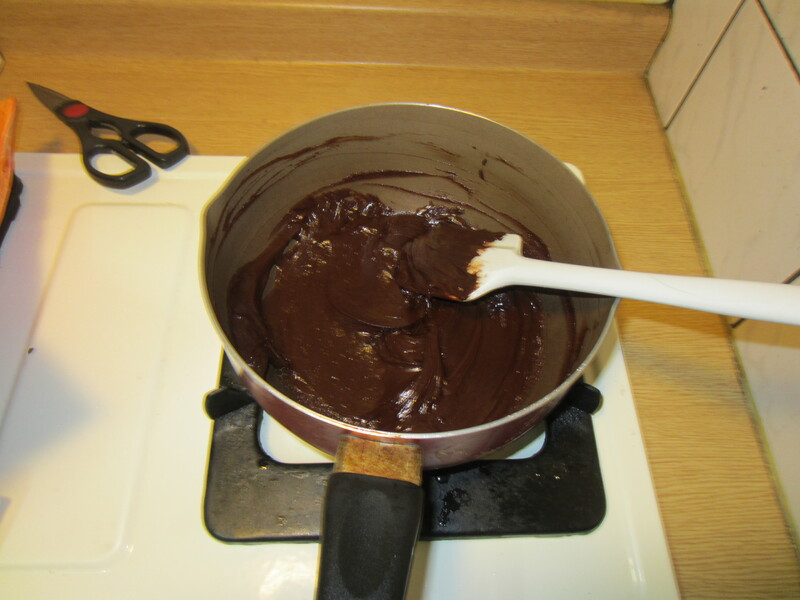 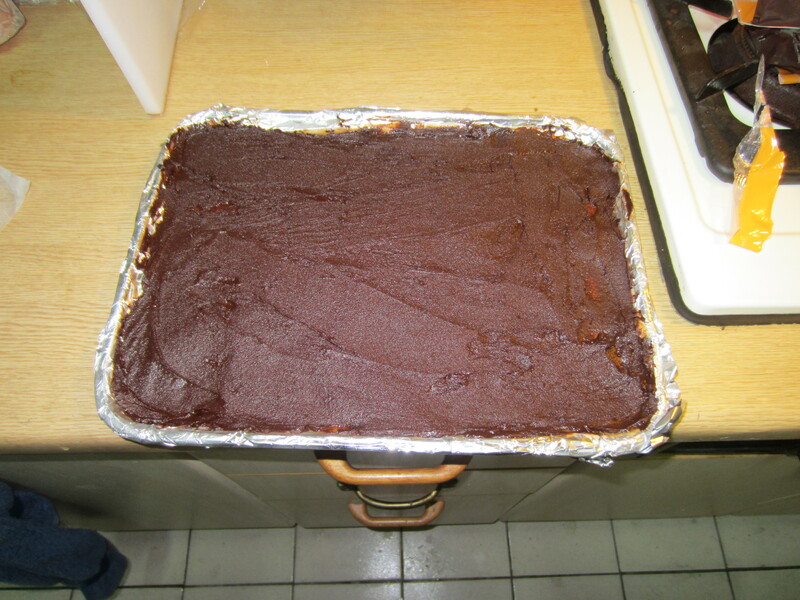 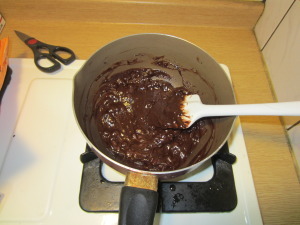 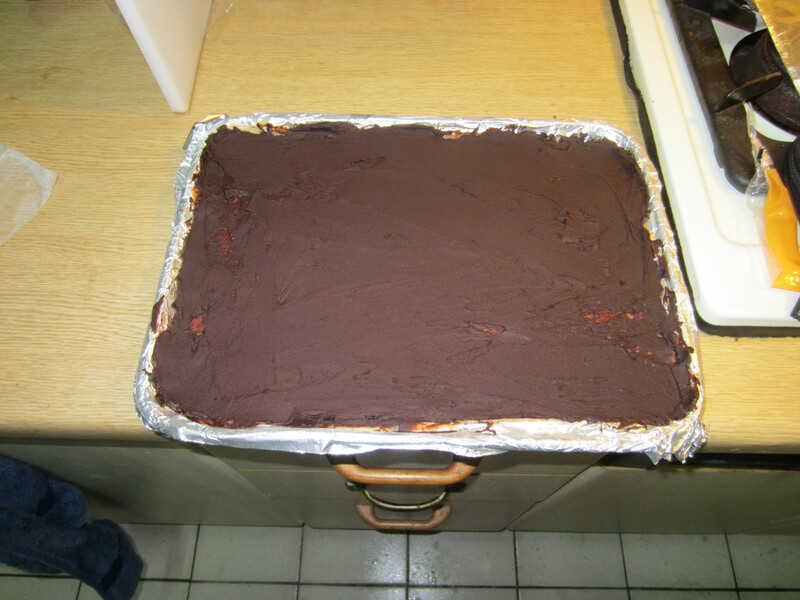 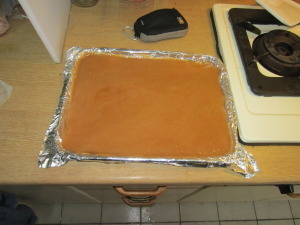 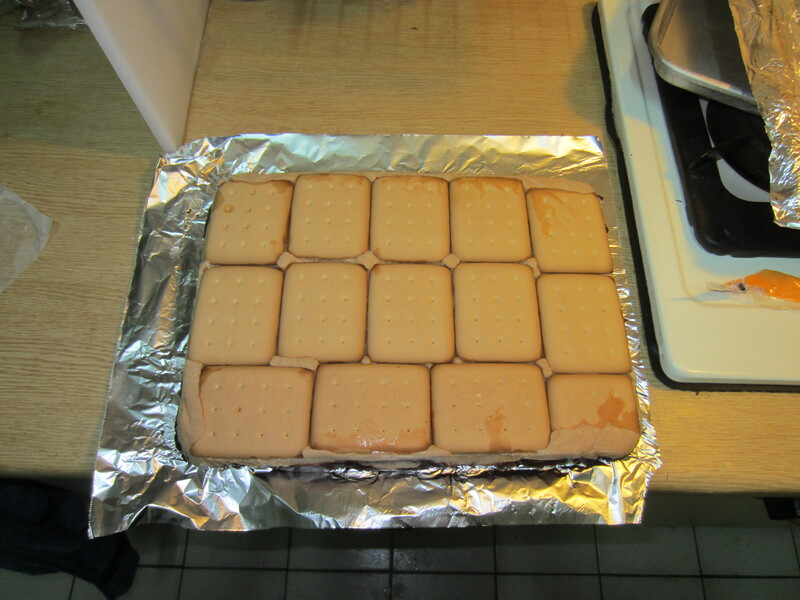 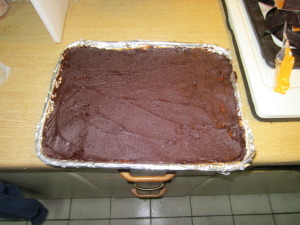 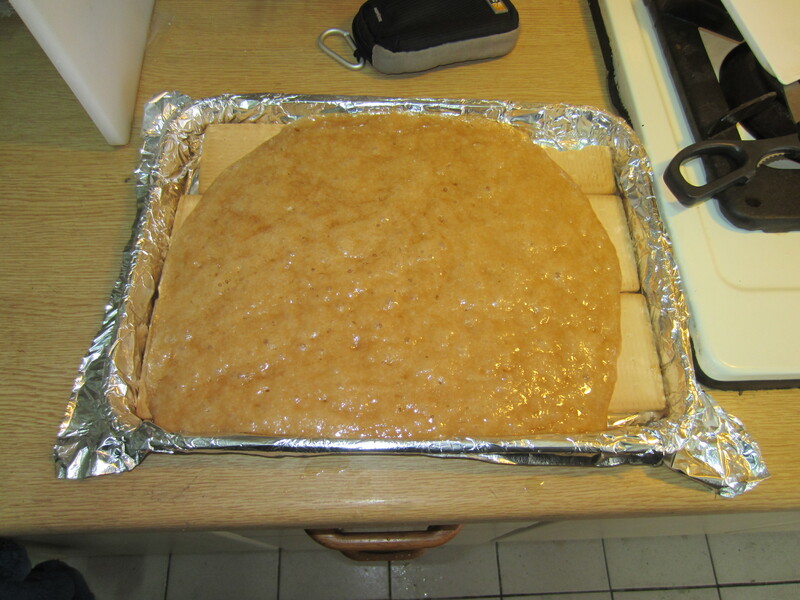 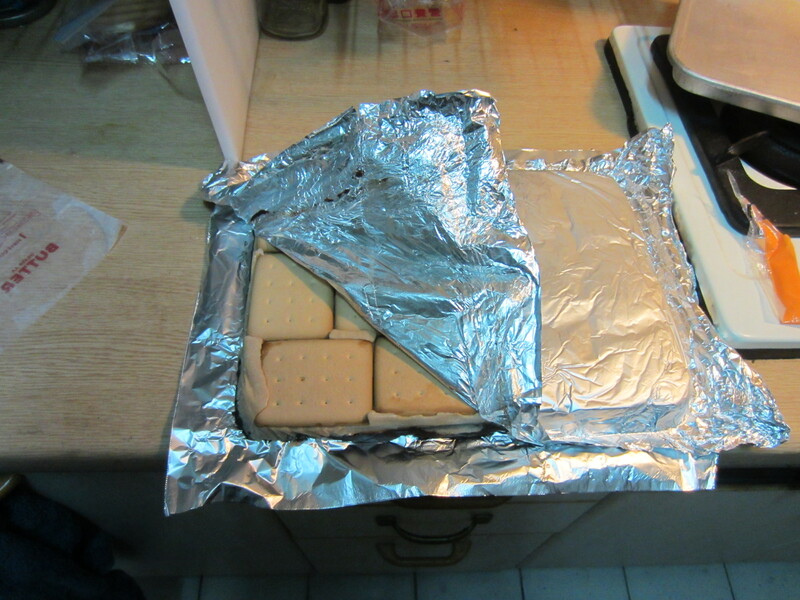 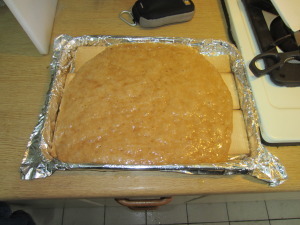 If you use a larger pan, the English toffee layer will be much thinner, and you may have to melt more chocolate. 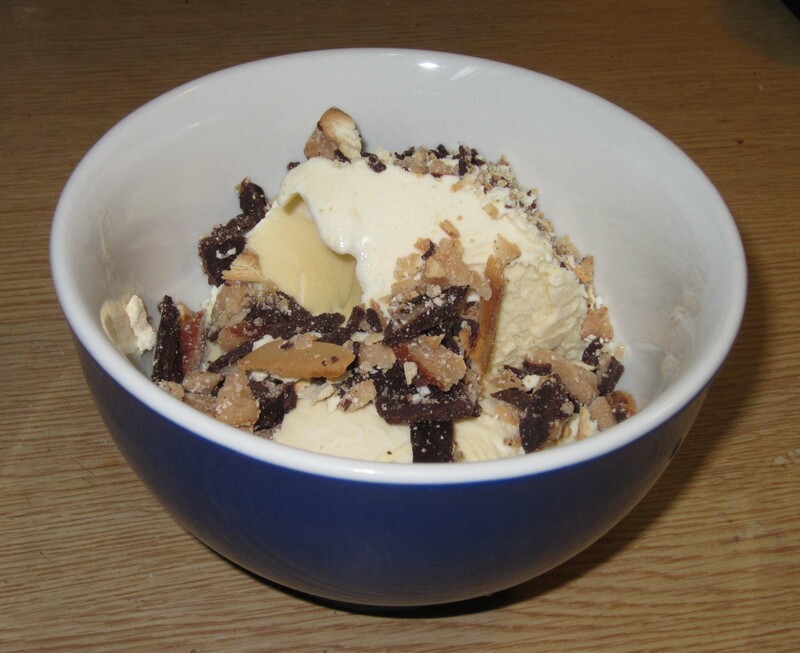 Save the crumbs; it makes a great ice cream topping! 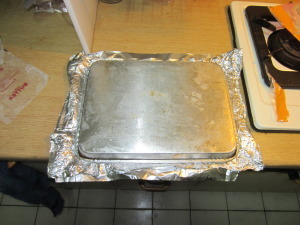 The cookies are good to freeze, if you have to. You can forgo the cookie layer and only do toffee, but most people who try both say it’s better with the cookie layer. 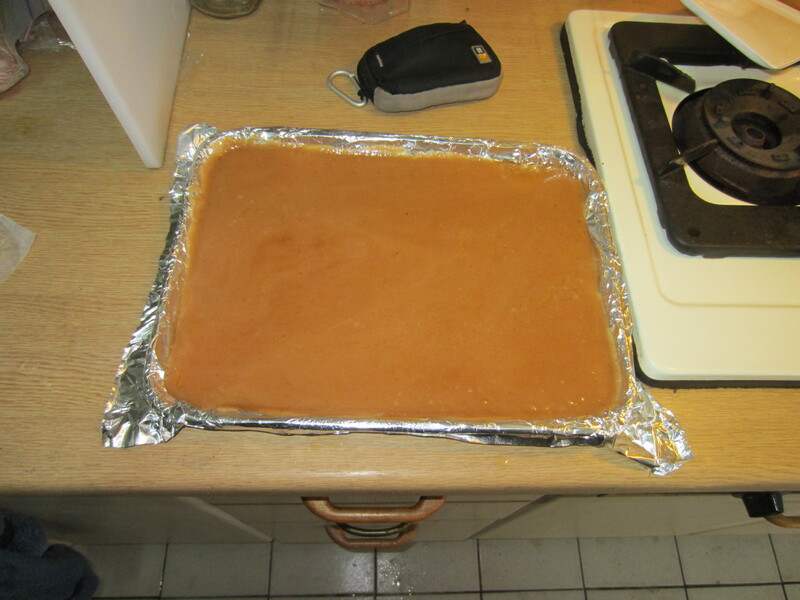 Another option is to just make the toffee, let it cool, break it up, and add it to my awesome four ingredient fudge recipe. 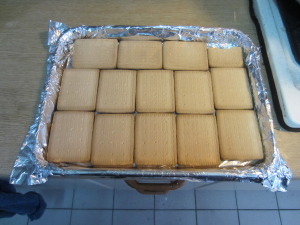 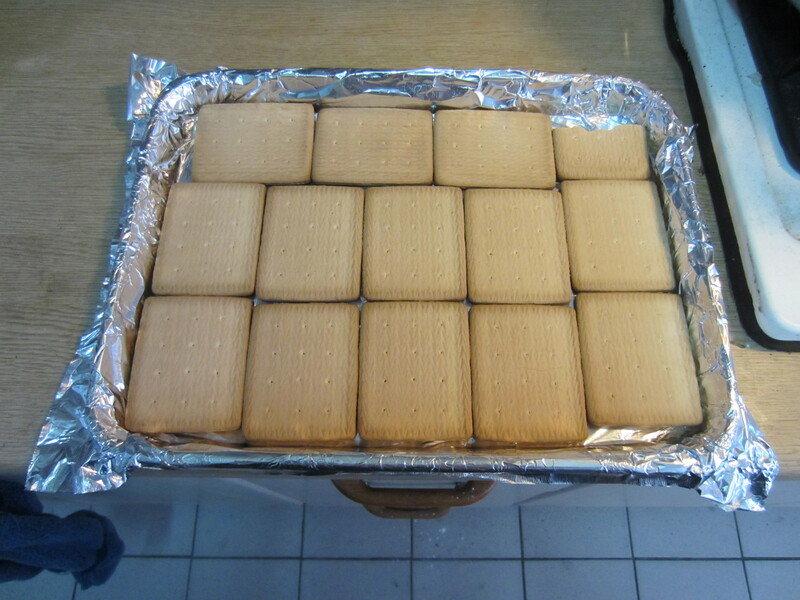 Enjoy the English toffee cookies! This entry was posted in Uncategorized and tagged awesome, cookie, cookies, delicious, easy, english toffee, five ingredient, five ingredients, how to, recipe, simple, toffee, two ingredient, two ingredients, yummy.